Art class was an "eating my broccoli" sort of night this Wednesday. Same model and same pose as last week, but I didn't feel like doing the same painting, so decided to concentrate on her head. But I *do* hate trying to do portraits! I can create an image that is recognizably a person, but not necessarily the person I'm trying to paint, LOL. But I still plug away, and am even taking a 2-session workshop in portraiture early in August. However I did end up enjoying this, and was pleased with how the hair turned out, and the shadows. 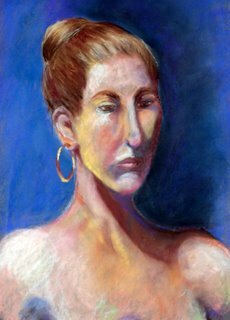 One of the other students said it reminded her of Modigliani, and I can see a bit of resemblance to his work in her long, thin face - maybe a bit similar to this one . The hair does look good.